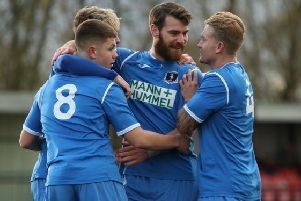 Joint Padiham boss Adam Morning admits that he’d be ‘gobsmacked’ if the Storks were sucked back in to trouble in the Hallmark Security League Premier Division. But the 32-year-old isn’t prepared to count his chickens before they’ve hatched and has put plans for next season on the back-burner. The midfielder, who has featured for Stalybridge Celtic, Halifax, Salford City, Northwich Victoria and Colne during his playing career, is itching to get the ball rolling but everything has been put on hold until their survival has been mathematically rubber-stamped. A point this weekend against Silsden at The Cobbydale Construction Stadium could secure safety should West Didsbury and Chorlton, who have a far inferior goal difference, fail to pick anything up at Irlam. “It’s nearly done now,” he said. “Results have been going our way so it’s looking like we’re nearly there now. The pressure is off now and you could see that in the way they’ve been playing. “We’re not mathematically safe yet but it’s a nice feeling being in this position. We won’t be taking our foot off the gas but I believe it’s well and truly over. He added: “We’ve made a couple of phone calls and the second our safety is confirmed, which could be this weekend, we’ll get things moving. Everything will be geared towards next season as soon as we’re safe. We don’t want to take our mind off this season just yet, we can’t afford any distractions, but the work starts the second it’s done. Morning, who took over the reins alongside Michael Morrison in January, has certainly turned things around at the Ruby Civil Arena in a short space of time. An 8-0 defeat away at Ashton Athletic on the back of Liam Smith and Dixon Lambert’s departure gave them an indication of what they were up against. And with players walking through the exit as a consequence, the new management duo were struggling for numbers ahead of their first game in charge against Northwich Victoria. “The performances have been very good and the attitude of the lads since we took the job has been unreal,” said Morning. “We’ve been doing really well and I’m buzzing with the lads at the minute. “When we were appointed the team went to Abbey Hey and were beaten 8-0. Our first game in charge was against Northwich Victoria and we had eight players going in to the game. 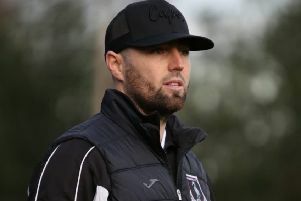 “We signed three players on dual registration and had to speak to our Under 23s boss Michael Worthington to get three players to sit on the bench. “Those were the circumstances we were working under when we arrived at the club. “We’ve got a full squad now and won two of our last four games so we have turned it around.